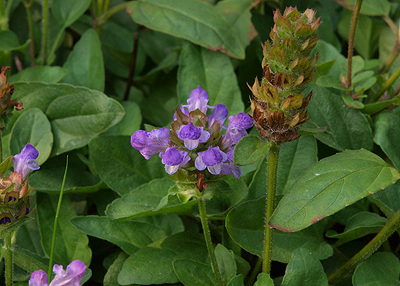 ‘Natsukarekusa’ is a Japanese for Prunella vulgarisW, commonly known as ‘heal-all’, an herbaceous plant in English. But if you are familiar with kanji and know how to read them, the kanji resembling ‘Natsukarekusa’ is not read as they read now but read ‘Daitou’. And this is one of the difficult parts of the kanjis in Japan…. As kanji characters came from China and were thought be be pronounced like the Chinese in Japan in the first place, most of the pronunciation started to change its pronunciation to fit the Japanese original language. Like this phrase’s ‘Natsukarekusa’, ‘Daitou’ (or other pronunciation of these kanji characters) may have been the proper name and the pronunciation of this plant in the first place which may have come from Chinese for this plant. But to the Japanese, the name of the plant, ‘Natsukarekusa’ should have been more common, changed the whole pronunciation of the kanji of ‘Daitou’ to ‘Natsukarekusa’. What is confusing is that there is another kanji for ‘Natukarekusa’ which we can be read it as it is, unlike the kanji used in this term’s phrase and when we actually use them, we use this kanji to point out ‘Natsukarekusa’ and not the kanji used in this term’s phrase! So, back to the ‘Natsukarekusa, the ‘heal-all’. This plant in Japan has also been a herbaceous plant from ancient times like in other countries. It was said to have effects on swells, nephritis and cystitis. Natsukarekusa were collected when withered and dry after the flower for herbal medicines. We don’t want to confuse you but there is another name for this plant, ‘Utsubogusa’, meaning ‘quiver weed’ as the flower looks like the quivers used in the archery. As you can see by the number of names we have to this plant, the plant has been familiar to the old Japanese. Now, the reason why this plant was used to express the season comes from the belief of ‘Ichiyo-raifuku‘ mentioned above. This little plant has an interesting botany of coming into bud at this time of the year in Japan when other plants are still seeds under the ground. It should have been a symbol of positive qi that started to spring out after the extreme of negative qi at Touji. The last word, ‘shozu’ is a verb meaning ‘be born’ or ‘be yield’, telling you the whole phrase of the season expresses that it’s the time when Natsukarekusa is coming into bud, reminding you that the dawn (Spring) is near. 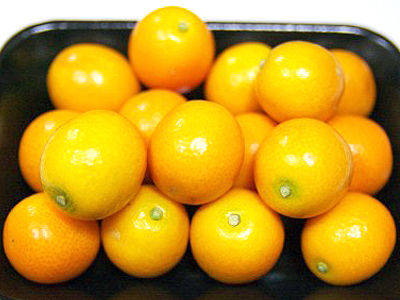 YuzuW is a citrus fruit, rarely eaten as a fruit but its zest and juice are used a lot in Japanese cuisine. It has been nurtured in Japan from Asuka periodW and has been colouring the grey gardens with its golden fruits in this time of the year as the plant is cold-tolerant. The ancient Japanese had respect on its fruits as it takes more than 10 years until fruition for cultivation from the seed, wishing that their long hard work will pay off like how the Yuzu bear their fruits. On the very day of Touji, many Japanese prepare yuzu to put in their bathtub. This ‘yuzu-yu (yuzu bath)’ tradition is said to have started from Edo periodW which came from the idea of purification ceremony to bring in luck for the New Year as Touji was thought to be the start of the New Year in the ancient days. Yuzu were put in the bathtub because of their lovely fresh citric scent to purify the malicious and negative qi which have been accumulated within the body in the year. Like incense sticks offered in temples and Buddhist altar at home in Japan, strong lovely fragrances are thought to keep off the evil and the bad. Yuzu-yu is still thought to be a bath to keep away from catching cold in winter and it is scientifically effective to cold constitution, neuralgia and lumbago. The scent of yuzu in a bathtub also gives you relaxation effects according to aromatherapy. Bath with yuzu, ‘yuzu-yu’. Photo from ‘Misasakan Staff Official Blog‘. Because the pronunciation of the word ‘Touji’ is similar to the Japanese word for ‘hot-spring cure’ and the pronunciation of the word ‘yuzu’ is near to the pronunciation of the word meaning ‘flexibility’, taking the yuzu-yu on Touji is thought to be the pun and distortion of the meaning of taking a bath at that time of the year will purify the body and soul which will be flexible and durable to whatever misfortunes that may happen in the future by public bathhouses which stated their business in Edo period. 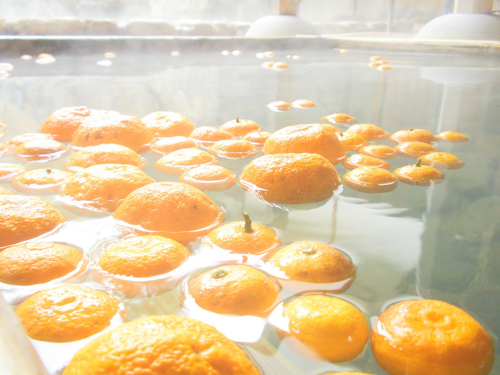 Yuzu is popular in bathing agents in winter. 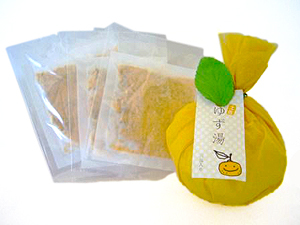 Many varieties yuzu bathing agents are sold! Ideal souvenir. Photo from ‘Matsuda Medicine Official Site‘. If you ever have a chance to go to ‘sento (public bathhouse)’ or spa at this time of the year in Japan, many prepare yuzu-yu, a special scented bath! Even in your own country, we are sure you can try it with your local cheap citric fruits! Get 5 or 6 yuzu or alternative citrus fruit, slice them and float them in the tub. Or if you have sensitive skin, it will be better to steam the sliced yuzu for 20 to 30 minutes on boiling water before putting hot water in the tub then put the sliced-steamed yuzu in a cloth bag and float it in the tub. Don’t forget to wash the fruit thoroughly before slicing them to get rid of the agricultural chemical on the outer rind. 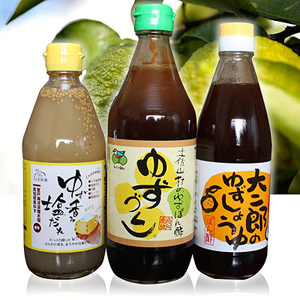 Many varieties of ‘Ponzu’, yuzu (or other citrus fruit) juice and soy sauce based dipping sauce, are in the market. Photo from ‘Tosa ryohin-ichi Official Site‘. 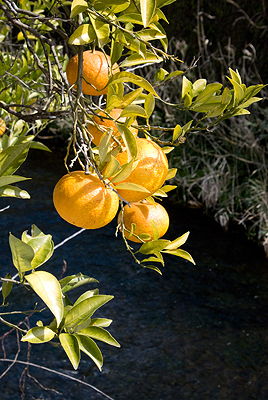 Yuzu in Japanese cuisine, mainly as a source or condiment reminds us the season by our nose in Japan. Fresh cut yuzu to simply squeeze onto grilled seasonal fish with a little bit of soy sauce or dipping sauce for traditional hot caldron dishes are great seasonal treatment for chilled stomach in cold weather at this time of the year. Sounds strange to you? We are sure it does. This idea came to common from a pun of Japanese word ‘Un’, meaning luck. Therefore, this ‘N’ is pronounced as [un] in phonetic symbol and not [en]. Before going on further, we have to tell you a bit about the belief of ‘KotodamaW’, a belief of mystical powers that dwell in words and names. Giving you the rough idea of what Kotodama is; the positive image words or names have positive power and the negative, the negative power. For instance, if you visit your sick friend who is staying at hospital room in Japan, you will find that there is none or less ‘4th floors’ or room number starting with ‘4’ (some urban hospitals have ‘4th floor’ or ‘4’ on room numbers). This is because ‘4’ is pronounced ‘shi’, which its pronunciation is the same as the word for ‘death’ in Japanese. Of course there is no evidence that using the number ‘4’ in hospitals would increase the numbers of the dead but because the Japanese have been living with the Kotodama theory for long, the relation between the Japanese and the Kotodama still exists, even today. By now, we guess you have the idea why “foods consisting ‘N’ in their names’ are seasonal things at this time of the year. Yes! They are related to the Touji – when negative qi is at its peak. This means that you need to provide some positive qi things to energize your inner positive qi so that the peak negative qi around you will not erode your luck. 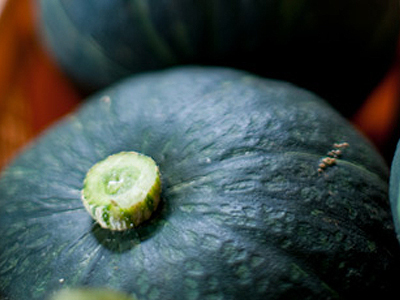 There are many food that consist character ‘N’ in their names but the foods appropriate for this season are those that exists today from the old days. 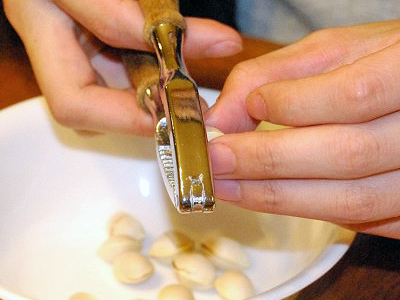 Cracking theshell of ‘ginnan’, ginkgo seeds. UdonW – ‘Udon (used to pronouce it ‘undon’)’, etc. They are like eating ‘blackberries’ (consists the ‘luck’ in pronunciation) on Touji if you are doing it in English. 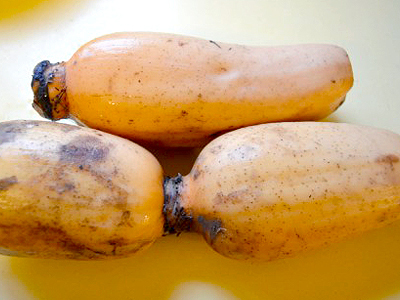 The belief of eating these foods on Touji are known as ‘Un-mori (piling up luck)’. As said in above, the belief came from the idea of taking the positive power in from positive substances outside but it also has meaning of taking in nutrition by eating nourishing food of the season. Moreover, since ‘N’ is the last letter in old Japanese syllabary, ‘Iroha, it was related to the theory of ‘Ichiyo-raifuku‘, like ‘Ω, (Omega)’ in Greek which has symbol meaning of ‘the end’. ‘Azuki-gayu’. Photo from ‘azuki-gayu’ recipe by” jun-bo” on ‘Cookpad‘. Made and eaten on the very day of Touji in some parts of Japan. 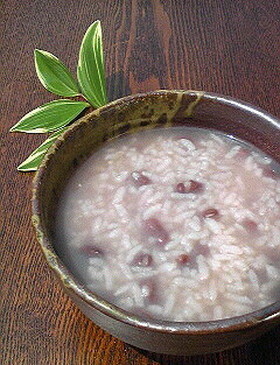 The tradition of eating such congeeW on the very day is thought to come from the belief of Azuki beansW that they have a magical power to expel evil spirits. The Azuki-gayu is eaten also a lot in Japan at next term, Makkou so we’ll leave more information until then.